Pray for Denmark: Cold storage? Not any more! Cold storage? Not any more! 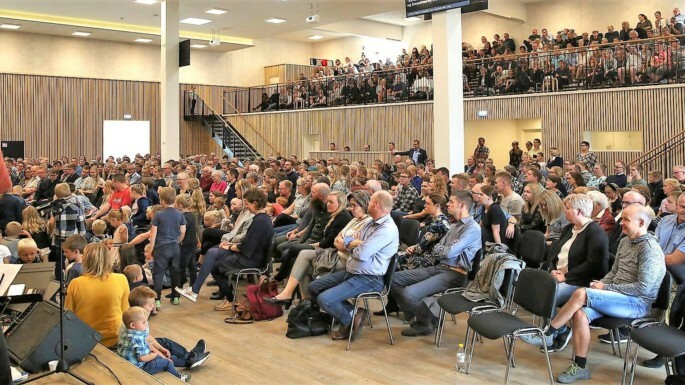 Things are warming up in the small town of Skjern (western Denmark), where believers have turned a cold storage facility into a beautiful new multi-purpose worship center. Late last month, much of the town and well-wishers from surrounding cities crammed into the new 600-seat sanctuary at the Skjern Bykirke (City Church) to celebrate. During opening ceremonies September 23, Copenhagen-area pastor Niels Jørn Fogh complemented the growing independent Lutheran congregation for their vision. The building now hardly resembles the former Danish Crown meat packing center. Besides opening up a large space for worship, the new church facility also includes plenty of room for youth, offices, and a café. Skilled and unskilled volunteers provided much of the needed labor. Skjern Bykirke was established in 2006, and is part of the Evangelical Lutheran free congregations. It currently includes 430 members, but that number will be growing! PRAISE GOD for this new facility, and for the impact this church will have on a small community. PRAY for the leadership at Skjern Bykirke, for wisdom as they follow what God is doing there. PRAY with this congregation that more people will come to know Jesus in Skjern and the surrounding countryside. PRAY that this entrepreneurial example will encourage other believers throughout Denmark to step out where the Spirit of God leads.